You’re going to Disney World! Now what? Did you pick your resort? Good! Now it’s time to decide on park tickets! Do you want to go to multiple parks per day? You need a Park Hopper! Want to focus on one park per day? Stick with the base Magic Your Way ticket. Disney announced a new pricing structure for the tickets in February of 2016 which includes seasonal ticket pricing for the one day tickets. If you are planning on going for longer than one day, then you will not be affected by seasonal pricing! This ticket structure allows guests into one theme park per day. If you are staying on property, you may want to consider going to whichever park has Extra Magic Hours scheduled for that day, that way you can maximize your time in the parks! Park Hopper Plus tickets allow guests entry into all four of the theme parks in a single day, as well as admission into the two water parks, Blizzard Beach, and Typhoon Lagoon, ESPN Wide World of Sports, a round of mini-golf per day, and one round of golf at Disney’s Oak Trail Golf Course. If you are looking to play mini-golf at either Fantasia Gardens or Winter Summerland, be aware that this admission must happen before 4pm and you cannot play at Fantasia Gardens and Winter Summerland in the same day. The single round of golf at Disney’s Oak Trail requires a tee time reservation. The Park Hopper Plus option is not available in a single day ticket. Please note: Adult price are for ages 10 and up. Children prices are for ages 3 – 9. Prices do not include tax. 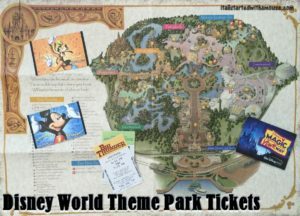 The 4-Park Magic Ticket is the best way to experience Walt Disney World theme parks with one day of admission to Magic Kingdom park, one day of admission to Epcot, one day of admission to Disney’s Animal Kingdom park and one day of admission to Disney’s Hollywood Studios on 4 separate days. I agree! It is a great way to see all 4 parks at a very affordable rate! Maps of Walt Disney World provide an overview of Walt Disney World Resort —or you can view individual theme parks, water parks, Disney Resort hotels, golf courses, and shopping, dining and entertainment areas.